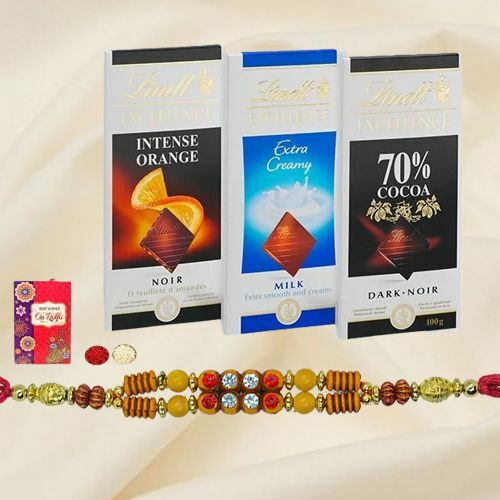 Paint a broad smile on the faces of the people you love on Raksha Bandhan by sending them this Exotic Lindt Chocolate Bars with Rakhi Hamper for Auspicious Occasion complemented with a free Rakhi, Roli Tilak and Chawal. This Gift Hamper is accompanied with Lindt Excellence – Extra Creamy, Lindt Excellence – Orange Intense, Lindt Excellence 70 . The designed pack may vary a little.